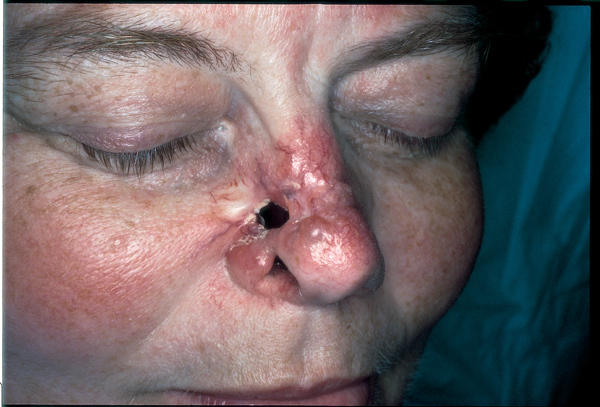 At the insistence of her daughter, a 72-year-old woman sought treatment for a deep nasal ulceration that had perforated the skin and cartilage and exposed her nasal septum. The lesion occasionally bled but otherwise caused minimal symptoms. The patient wore a large Band-Aid whenever she was in public. Years earlier, she had had a nasal growth removed by her general practitioner, who has since died. She failed to seek further medical attention when the growth returned about 10 years ago.